A refined PVA product – the Continuous Deluxe Micromesh PVA has a fine denier weave, ideal for use with maggots and tiny pellet and powder combinations. 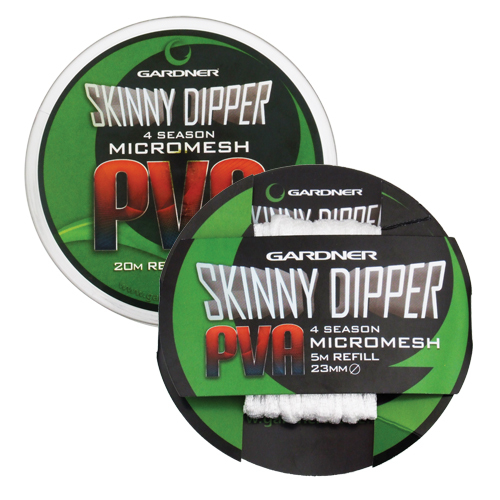 Gardner have developed the Micromesh PVA to be robust enough for all PVA fishing requirements yet fine enough to ensure rapid dispersal in cold water conditions. This is a highly recommended product – THE No.1 PVA that top anglers choose. Consistently out performs all other PVA mesh materials, especially when used in cold water. Available in 5m or 20m refills. The ‘Skinny Dipper’ Boilie size refill is the perfect size PVA for subtler and smaller bags – a great benefit where range dictates the need for a smaller bag. Perfect for use with the popular ‘stick’ method of fishing whether with compressed groundbaits, ground bread or even crushed pellet.